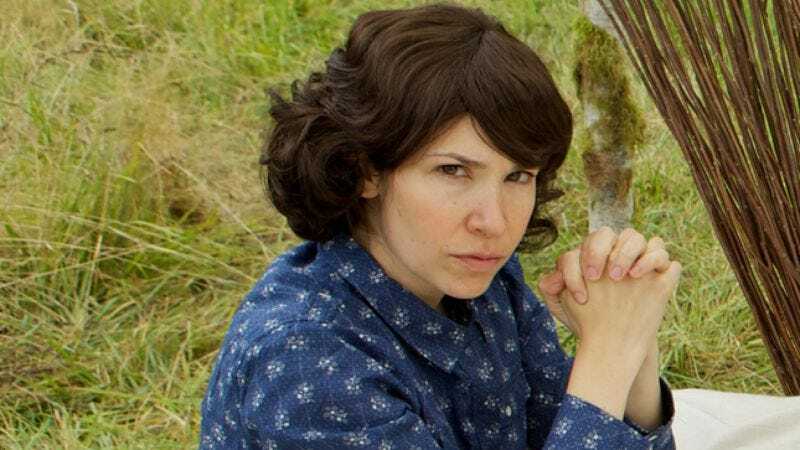 Few would immediately think of Carrie Brownstein, best known for her work with seminal punk group Sleater-Kinney, to star in a sketch-comedy series, even if sketches featuring her and co-star/friend Fred Armisen (Saturday Night Live) have appeared online for several years. Yet tonight at 10:30 ET, IFC debuts Portlandia, a six-episode sketch-comedy show featuring her and Armisen as a string of baffled, left-leaning characters who try to do the right thing and fail miserably. Brownstein, who lives in Portland, created and wrote the project with Armisen. She recently spoke with The A.V. Club about how rock music and sketch comedy are similar, why she gave up her childhood acting dreams for punk rock, and just how hard it can be to be a good progressive. The A.V. Club: What is the intersection of rock music and improv sketch comedy? Carrie Brownstein: I think that the process of writing a song or performing onstage, especially with my old band Sleater-Kinney, was a lot of disparate parts coming together and figuring out ways to make them feel cohesive. I think onstage, a lot of what it was was capitalizing on a moment and being okay with that “moment” being spontaneous and changing the whole nature of the show or the song. Then, of course, it’s about energy and being able to intuit where to go with energy, and when to raise it and when to pull back, so I think there are actually a lot of intersections between improvisation and music, especially the way that Sleater-Kinney operated. AVC: You’ve worked with Fred Armisen for a while. How did you two first start working together? CB: We knew each other through music. Sleater-Kinney were playing in New York on a Saturday, and he had just started on Saturday Night Live, so he invited us to the after-party, because our show and his show were kind of taking place at the same time. So we went to an after-party, and we started talking there. We knew a lot of mutual friends and had an instant connection, and he said he wanted to collaborate on something. I assumed it would be music. [Laughs.] And he wanted to come out to Portland. Subsequently, we did a lot of sketches under the moniker ThunderAnt for about five years until suddenly we had 14 sketches, and that’s when we decided to formalize it. AVC: Had you done some sketch comedy before you met him? CB: It was a new thing for me. As a kid I was interested in theater and in acting and actually pursued that instead of music as my creative outlet. But I think, like a lot of angsty teenagers, once I discovered punk rock, it was like a revelation. There is something so immediate and visceral about music; you can form a band and be playing a show within a week, and you’re so immediately gratified by that. That just seemed so much more exciting than moving down to Los Angeles from Seattle. All of a sudden, music was my religion, and I let acting go. I think there was that interest in performing as a kid, so it wasn’t uncomfortable for me to get back into it. But music was my first love. AVC: What parts of yourself are satisfied in different ways by those two pursuits? CB: Well, I take music pretty seriously. [Laughs.] I think that music, for me, has to have an urgency. I don’t know why you would form a band and not want your life changed by it and not want to change someone’s life. Or that there wouldn’t be something that was earnest or fiery or walking on a ledge [about it]. I do think that there are similarities between comedy and that. I think that a lot of comics actually come from that same angsty, outsider place as musicians, and I think that’s why you see a lot of marriage between the two, and they work really well together. But music for me is not a joke. I think there are things in both that are about exposing a universal truth. When you listen to a song or a band, and you think, “Finally, someone has explained this phenomenon, this feeling to me, and I could never express it myself.” I do think there’s something about comedy too, where you can also do that—where you can watch a sketch or see a comedian onstage and realize that they are telling you something about a phenomenon that you already knew about, but they’re finally able to explain it to you. That ineffable quality, they’re able to say it. So, like I said, the music is sort of the serious part, but the comedy for me is a different way of letting go, of letting go and being able to lose control but maintain a sense of grace. I think it’s satisfied in both ways. Comedy, there’s a level of absurdism that I would just never want to go to in music. [Laughs.] There’s definitely people that have been able to get avant garde in music; that’s just not the kind of music I make. Whereas with comedy there is just this realm of playfulness and pretend and fantasy and silliness, and it’s the silliness I don’t get from music. I think that that’s really important. What I enjoy so much is just letting go in a way that’s just goofy. AVC: What were some of the weirder Portland locations you went while making the show? CB: Well definitely that farm we went to. It was strange. It’s a farm run by these three gorgeous guys. [Laughs.] They’ve moved out of Portland, they live just outside the city, and they’re raising chickens and rabbits. It was intense. They have all these bunnies that they’re raising for food. Just talking to them about the process of killing the chickens and bunnies, that was strange, just to be out there on a cold, early fall morning. You know, most of the locations were just places around Portland, so we were really comfortable with them. There is a sketch later called “Forest Meeting” that took us out to some weird mud flats and swamps that Fred and I had to walk through. Some of the nature stuff was stranger than the actual city stuff, but I think that the farm was one of the weirder places. AVC: What’s your creative partnership with Fred like? CB: It’s pretty natural, and I think that Portandia and a lot of the characters and sketches are extensions of how we interact with each other. We have obsessive conversations and do a lot of hyper-focusing on one thing. I think that we share a similar sensibility in not needing something to be funny, but just to be earnest. I think we share an earnestness. I think he really has an incessant optimism, and I’m a little bit of the cynic, so we meet in between. Our writing process, when it’s just the two of us, when we just sit around and throw out ideas, it’s very comfortable. It’s not a formal process. AVC: The main thrust of the series is about gently mocking various progressive groups. Are there any of these groups that you consider yourself a part of? I think that Fred and I have been on all those sides of things. I live in Portland. I want to eat local, but it’s so confusing sometimes. I went to sign up at this local bank and I thought, “Here I am, doing something good. I am going to stop using Wells Fargo and use a local bank.” I look across the street, and I see this giant sheet hanging from a window saying “Boycott Umpqua Bank,” and I was just like, “Ugh. Who am I supposed to give my money to? Squirrels?” It was like, “Umpqua Hates Old Growth Forests,” and I’m just like, “Well, okay, who loves the forests?” You can’t do anything. It’s just this sense of you’re trying to do something right, but someone else doesn’t think that’s good enough. I think, if anything, we’re not even mocking that; we’re trying to figure it out, too. I’d say I relate to a lot of the characters, even fixie-bike guy, who seems really extreme. I feel like anyone who rides their bike has that voice in their head sometimes. You feel so righteous when you’re riding your bike, even if you own a car. Like, I own a car, I drive a car, but when I’m on my bike, all of a sudden I’m just looking at cars as if they’re just evil entities, just hoping that everyone notices how good I am. [Laughs.] I feel like each of us have these people in them, the people that take things to an extreme, so I think that Fred and I are most of these people. AVC: And the show is heavily improvised, right? AVC: Did you have baseline scripts? CB: What we would do is brainstorm the ideas, and then we would flesh out those ideas and turn them into scripts, mostly for beats or for narrative arc, get a sense of the character, figure out what the button is at the end. But once we started shooting, if anything, the scripts were to help our locations people. So they just knew, “Okay, we need a bookstore, we need a coffee shop” because really, so little from the script is actually used once we get there. Often, we’ll ride somewhere, and our props person or production designer will put something in there, and all of a sudden, the whole sketch is about that thing. Or we’ll find something about a character in the moment, and that comes to define who that person is, and it totally deviates from who we thought they were. We were really lucky to work with a crew and a network that was trusting and nimble and imaginative, because it could be really frustrating, as a crew person, to think, “We’re going to follow this script line for line,” and it just never happened. AVC: Will your new group, Wild Flag, have an album out this year? CB: Yeah. It will be out in the fall. We haven’t recorded it yet. [Laughs.] But I do know what the songs are. Merge Records is going to put it out. It’s a four-member band. I think the songs are pretty dance-y and poppy, which I guess is a little bit different than Sleater-Kinney. I’m just really enjoying it again. Yeah, I’m excited about it.